Your team was great from the first phone call and email we sent to reserve the cabin until the day we checked out. You offered us great communication and follow up. The cabin was wonderful! More than we expected. We only had one issue and that was getting our small cars up the driveway. It may have been because the gravel was wet from the rain on the first day. Once everything dried out we were able to drive up the driveway just fine. This cabin was perfect for our 4 person family. It was just as advertised. All of the basic amenities you need. Beautiful mountain views, an hour away to skiing and snow tubing in the winter and minutes from whitewater rafting in the spring and fall. Cabin setting is quiet and private. Will definitely be back. 2nd year in the house and we enjoyed it. Would like to come again next year, we will see if I can swing it. Everyone I dealt with from beginning to end was so friendly and professional. You should be proud of your entire team. I would have loved to have had them working for my company! In a word, we found our stay "grand". The home is absolutely beautiful and could not be located in a more incredible location. The view was phenomenal, especially to us "flatlanders" from Central Florida. Everything was clean, the beds are incredibly comfortable. We all decided that our stay at this property was a significant reason why this holiday ranks in our top tier of vacations! Everyone I delt with from the beginning to end was so friendly and professional. You should be proud of your entire team. I would have loved to have had them working for my company. We have rented through you several times now and have had great experiences every time. Helpful staff and great cabins. The interaction with the team members was a good customer focus experience. 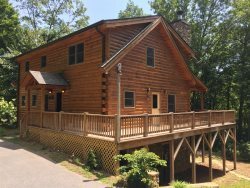 The property was exactly what we were looking and expectig for, ideal for vacation and ideal for having a great experience with the mountain. From our first contact with your company when finding the website, to the phone calls and emails, we received nothing but "first class" treatment with every member of your team! SunDance Ridge was the perfect property for us! Well maintained and well equipped. We could not have asked for anything more. The property was amazing. It was just a little scary driving up the mountains for the first time. =============Manager Response: Thank you for your feedback, Ulises. We're glad that you felt Above the Trees was amazing. Driving in the mountains for the first time can certainly be different when you're used to flat roads! Above the Trees is up a steep road, but that mountainside is a great place to enjoy the amazing view. We hope you were able to get acclimated to driving in the mountains and that you'll visit us again. As a repeat guest you will receive a 10% discount off any of our cabins. If Above the Trees was a little too high up for you, then just let us know -- we'll suggest other properties that aren't as high up in the mountains. This was our second stay at the Chalet at Battle Branch. We love the seclusion, the beautiful view of the mountains, the peace and quiet. The cabin is cozy and comfortable. We feel right at home there, and very much enjoyed our stay. Each time I called, each and every person I spoke with was friendly, helpful, and took the time to answer my questions. The pictures of Dream Catcher were beautiful, but to see it in person...absolutely stunning!! This cabin far exceeded our expectations. We wish we could have stayed longer. Staff was very helpful and they knew the property. They made sure you had everything you needed ands we're friendly. They explained what you would need to bring with you and what was available at the cabin. This experience was great and I will refer people. Out stay at Mountain Aire was a great experience. The view was beautiful and the cabin felt like home. This was the first time we ever stayed in a cabin. I'm looking forward to renting a cabin in the summer. We love the Hideaway Lodge it fits our family perfectly!